The Women’s Empowerment in Agriculture Index – What have we learned? November 17, 2017. Presenters: Hazel Malapit, Senior Research Coordinator, IFPRI, and Cheryl Doss, Senior Departmental Lecturer in Development Economics, Department of International Development, Oxford University. What determines public budgets for agricultural growth in the developing world? Community forestry. Where and why has devolution of forest rights contributed to better governance and livelihoods? What levels and composition of investment best serve global objectives of sustainable development? The PIM webinars aim to share findings of PIM’s research, discuss their application, and get feedback and suggestions from participants. Webinars will take the form of research seminars conducted by PIM researchers. Each webinar is a live event consisting of a presentation (30 min) and a facilitated Q&A session (30 min). Webinars will be recorded and shared on the PIM website. May 11, 2017 -- We are pleased to announce the launch of the PIM Monthly Webinars and the first webinar in this six-month series, The Rise of Medium-Scale Farms in Africa: Causes and Consequences of Changing Farm Size Distributions by Prof. Thomas Jayne on May 23, 2017, at 11:00 AM EST. This presentation highlights the causes and consequences of changing farm size distributions in sub-Saharan Africa. Medium- and large-scale farms account for a rising share of total farmland, especially in the 5 to 100 hectare range where the number of these farms is growing especially rapidly. Medium-scale farms control roughly 20% of total farmland in Kenya, 32% in Ghana, 39% in Tanzania, and over 50% in Zambia. The rapid rise of medium-scale holdings in most cases reflects increased interest in land by urban-based professionals or influential rural people. The rise of medium-scale farms is affecting the region in diverse ways that are difficult to generalize. Many such farms are a source of dynamism, technical change and commercialization of African agriculture. Evidence shows that the rise of bigger farms is encouraging new entry and investment by large-scale traders and more concentrated marketing channels as well as greater use of mechanization even by small-scale farmers. However, medium-scale land acquisitions may exacerbate land scarcity in rural areas, bid up land prices and encourage outmigration of rural youth. Medium-scale farmers tend to dominate farm lobby groups and influence agricultural policies and public expenditures to agriculture in their favor. 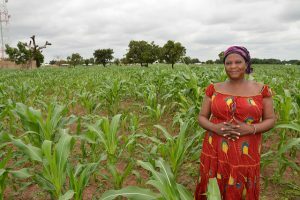 Nationally representative Demographic and Health Survey (DHS) data from six countries (Ghana, Kenya, Malawi, Rwanda, Tanzania and Zambia) show that urban households own 5% to 35% of total agricultural land and that this share is rising in all countries where two or more DHS surveys warrant comparisons over time. This suggests a new and hitherto unrecognized channel by which medium-scale farmers may be altering the strength and location of agricultural growth and employment multipliers between rural and urban areas. Given current trends, medium-scale farms will soon become the dominant scale of farming in many African countries. Thom serves as Co-leader of PIM’s research flagship on Economywide Factors Affecting Agricultural Growth and Rural Transformation.